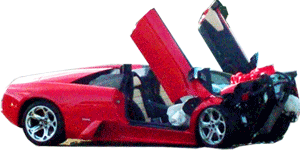 Lamborghini was speeding when a woman in a Fiat SUV turned in front of him. Luckily, nobody was injured. Lamborghini Gallardo. Happened in Budapest, Hungary.